Bridgette Mayer Gallery announces its participation in Art Miami 2012, from December 5 to 9, 2012, with a VIP Preview on Tuesday, December 4 from 5:30 to 10 PM, in the Wynwood Arts District of Miami, FL. 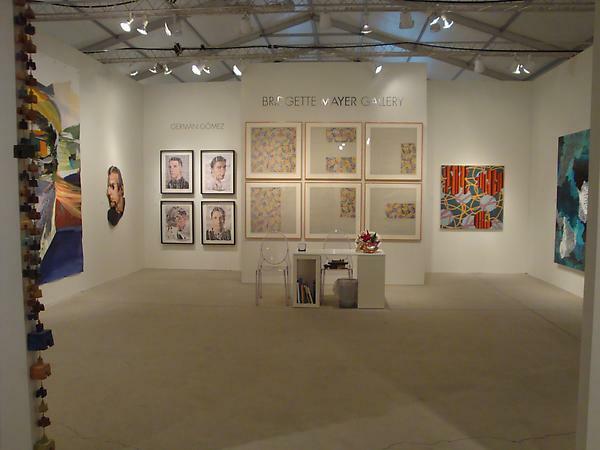 Bridgette Mayer Gallery will participate in the 2012 edition of Art Miami, which opens with a VIP gala on December 4th and runs to December 9th. This is the third year that the Gallery has been in Art Miami and the fourth in which the gallery has participated in a major fair in Miami. The Gallery will exhibit important secondary market works as well as a range of work by its primary gallery artists. With each fair the Gallery’s program has become increasingly ambitious, and this year promises to continue that trend. The centerpiece of this year’s secondary market presentation will be a suite of six prints by American master Jasper Johns. The prints, titled Untitled #1 - #6, are each about three feet square, and are lithographs done in eleven colors and show different layers of diagonal marks in a three by three grid. The booth will also feature an important lithograph by Swiss master Alberto Giacometti, a seminal painting by contemporary American Thomas Nozkowski, a suite of four “Black Hole” prints by contemporary American Ryan McGinness, and an important print by American modernist Man Ray. The Gallery will also feature work from a number of artists in their primary program. Philadelphia will be strongly represented with works by three artists with long and respected careers and one emerging artist. The booth will include photographs by Eileen Neff, paintings by Charles Burwell, sculptures by Stuart Netsky, and a large painting on Tyvek by Arden Bendler Browning. The international portion of the gallery stable will be represented by prominent Costa Rican painter Federico Herrero, Spanish photographer German Gomez, Venezuelan photographer Jan Rattia and American sculptor Paul Oberst. Since its establishment in 2001, the Bridgette Mayer Gallery has represented and exhibited artists whose work displays the variety and genius of contemporary art now being created in the US. The gallery’s ongoing exhibition program will continue to support established gallery artists even as it looks beyond the US to discovering and cultivating new talent from around the globe. The gallery exhibits painting, sculpture and photography with an emphasis on innovative process and content-driven ideas that speak to beauty, technology, culture and the contemporary landscape. Housed in an historic 1799 Philadelphia brownstone, the gallery presents ten exhibitions a year in its 3,000 square foot space and participates in numerous art fairs in the United States.